Nov 16, 2014: A map released by NASA's Near Earth Object (NEO) Program reveals that small asteroids frequently enter and disintegrate in the Earth's atmosphere with random distribution around the globe. Released to the scientific community, the map visualizes data gathered by U.S. government sensors from 1994 to 2013. 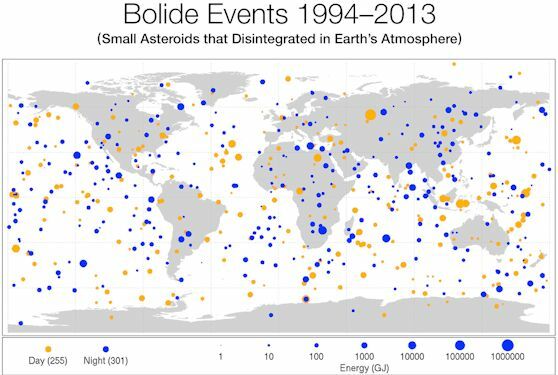 The data indicate that Earth's atmosphere was impacted by small asteroids, resulting in a bolide (or fireball), on 556 separate occasions in a 20-year period. Almost all asteroids of this size disintegrate in the atmosphere and are usually harmless. The notable exception was the Chelyabinsk event which was the largest asteroid to hit Earth in this period. The new data could help scientists better refine estimates of the distribution of the sizes of NEOs including larger ones that could pose a danger to Earth. Finding and characterizing hazardous asteroids to protect our home planet is a high priority for NASA. It is one of the reasons NASA has increased by a factor of 10 investments in asteroid detection, characterization and mitigation activities over the last five years. In addition, NASA has aggressively developed strategies and plans with its partners in the U.S. and abroad to detect, track and characterize NEOs. These activities also will help identify NEOs that might pose a risk of Earth impact, and further help inform developing options for planetary defense. The public can help participate in the hunt for potentially hazardous Near Earth Objects through the Asteroid Grand Challenge, which aims to create a plan to find all asteroid threats to human populations and know what to do about them. NASA is also pursuing an Asteroid Redirect Mission (ARM) which will identify, redirect and send astronauts to explore an asteroid. Among its many exploration goals, the mission could demonstrate basic planetary defense techniques for asteroid deflection. NASA's Jet Propulsion Laboratory, Pasadena, California, manages the Near-Earth Object Program Office for NASA's Science Mission Directorate in Washington. JPL is a division of the California Institute of Technology in Pasadena.